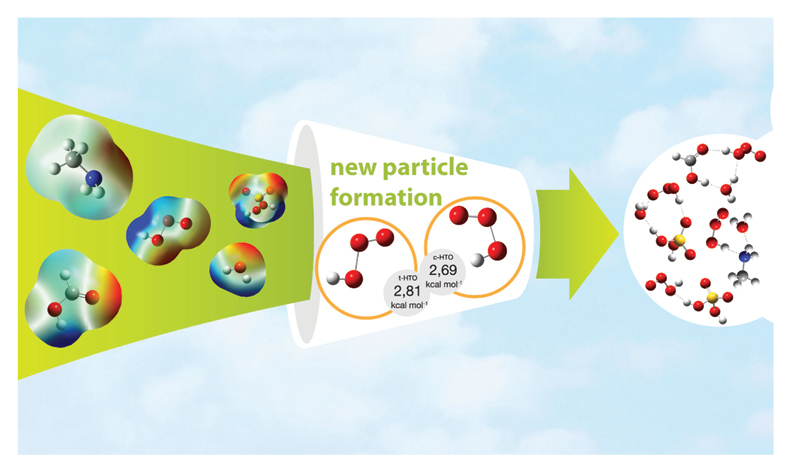 New particle formation is an important source of atmospheric aerosols, but the nucleation phenomena is still poorly understood. Here the formation of bimolecular complexes of HOOO• radical with H2O, CH3NH2, HCOOH and H2SO4 has been investigated by quantum chemical methods. The stabilising effect of methylamine is found to be close to that of sulphuric acid, both complexes are formed spontaneously at studied atmospheric conditions. In addition, the hydration of the four most stable 1:1 complexes forming the 1:1:1 complexes have been considered. Water stabilises a HOOO•⋯H2SO4 complex, the most effectively. Complexation process is spontaneous as well. Complex formations induced significant red-shift and enhancement of the IR intensity for the OH stretching vibration relative to that of the free radical. Equilibrium constants have been examined and the relative abundance of complexes in the troposphere is discussed.